This glidy, super-softening organic lip balm gets its color from organic and wildcrafted herbs, which we infuse in our organic oils. No petroleum-derived FD&C lakes, irritating animal-based carmine, or other synthetic colorants! 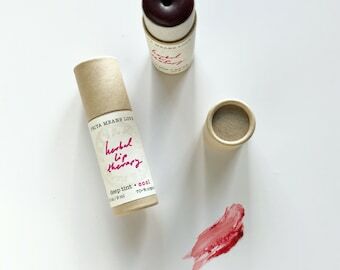 This lip balm leaves a flush of pink on the lips, totally natural-looking on every skin color. One stroke is light and subtle; build for more intense color. Serious therapy for chapped lips. This may be the most nourishing lip balm you ever use! Really stays on the lips. 0.15 oz standard size lip balm tube or 1/2 oz screwtop tin (over 3x the amount in a tube). Comes with a handmade label and information sheet. Ingredients: organic castor bean oil infused with wildharvested alkanet root and organic annatto seed, local beeswax, organic extra-virgin olive oil infused with organic calendula petals, organic jojoba oil, vitamin e from non-gmo sources, and organic essential oils. "I love this lip therapy! It looks so pretty and it feels really nice on my lips. I especially love that both products that I bought are completely organic and wholesome. It makes me feel good to be able to use products om myself and family that works well and is good for you." 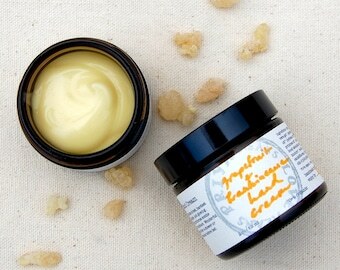 "Awesome, lightly tinted healing balm. It's soooo nice, I'm addicted already." "Subtle color, feels wonderful when applied. Would definitely recommend this product." Great formula but with zero color payout. I've tried it on my lips and on the back of my hand, but don't see a tint either way. Lovely scent and moisturizing though. I can't say enough about this lip balm. I ordered extra tubes to keep by my bed and in my office!